BRIAN WILLIAMS, anchor (Venice, Louisiana): He started in Congress when the world was a different place, and he was a different man. First in the House , then the Senate , an institution he served longer and likely knew better than anyone else ever. Senator Robert Carlyle Byrd , Democrat of West Virginia , died early this morning at the age of 92. Our own Kelly O'Donnell takes a look at his life. KELLY O'DONNELL reporting: Today, this sign of respect marked Robert Byrd 's unmatched place in American history . Vice President JOE BIDEN: We lost the dean of the United States Senate , but also the state of West Virginia lost its most fierce advocate. O'DONNELL: A record 57 years in Congress , sworn in a senator the day Alaska became a state. Senator ROBERT BYRD: Being a United States senator is the highest public office that this country can give. Presidents come and presidents go, but senators don't fade away. O'DONNELL: His Senate career spanned 11 presidents. Eleven days ago he cast the last of 20,000 votes. Sen. BYRD: Speak loudly! Can you hear me ? O'DONNELL: A master of Senate rules , history and oration. Sen. BYRD: There's a day of reckoning coming, and it isn't far off. Sen. BYRD: Man, you're looking at big daddy . Big daddy ! O'DONNELL: ...his name is all over West Virginia for the billions in federal money he delivered to one of the poorest states. Raised in foster care and desperate poverty himself, he knew hardship. O'DONNELL: Byrd's politics changed dramatically with the times. Once a member of the Ku Klux Klan turned advocate for civil rights. He supported the Vietnam War and opposed the war in Iraq . Sen. BYRD: Invading a country without our having been provoked, that was unconstitutional in my book. O'DONNELL: Senate work gave him comfort after the loss of a grandson and his wife. That famed fiddle playing kept Robert Byrd close to home. Kelly O'Donnell , NBC News , the Capitol . 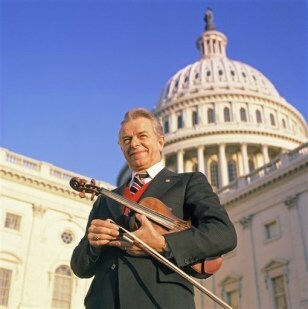 In a 1977 photo provided by County Records, Sen. Robert C. Byrd, D-WV, posed in front of the capitol building with his fiddle.